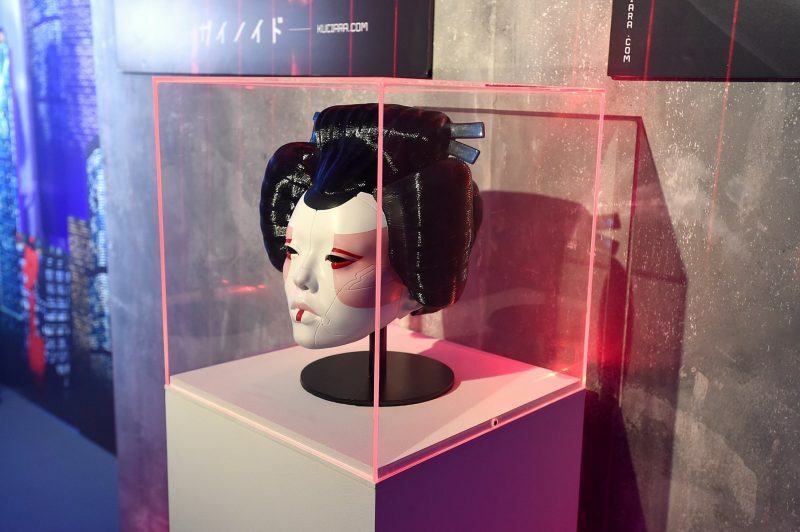 Paramount Pictures transformed London’s leading neon and light-art gallery last week into a completely interactive and high-tech immersive pop-up experience to celebrate the launch of their latest blockbuster Ghost In The Shell, starring Scarlett Johansson. The Japanese cyberpunk classic, based on the internationally acclaimed Manga series by Masamune Shirow, tells the story of the fictional cyber terrorist organization Public Security Section 9, led by protagonist Major Motoko Kusanagi in mid-21st Century Japan. Scarlett Johansson plays a convincingly androgynous lead protagonist, ‘The Major’ in Rupert Sanders live-action adaptation. Set amongst a concrete jungle of skyscrapers and underground enclaves, we were eager to see the film come to life at the much-hyped experiential pop-up in the heart of Soho. Upon entering the venue, was a fully interactive, Minority Report ‘esque’ touch-screen window where we were invited to explore the characters and scenes from the film by moving and expanding different components across the screen – the sight of us all playing with the futuristic instillation drew quite the crowd on the street! Stripped of its usual, famed bright neon interior, the Soho gallery space was converted into a concrete fort with strips of blue, purple and red lighting expelled across the walls, reminiscent of the film’s futuristic, urban architecture. Guns and other exclusive memorabilia had been flown in especially and displayed on the walls, including an animatronic Geisha mask worn in the film. Not ones to do things by halves, Paramount Pictures even had a 360° hologram of the mask installed! Transporting us into a fictional cyber world, London based electro-pop trio, Sälen provided the soundtrack for the experience with a mixture of trip hop beats to set the futuristic tone. Sticking with the Japanese theme, we were treated to delicious platters of sushi throughout the evening, washed down with bespoke saké and Grey Goose cocktails. Our favourite had to be the aptly named ‘The Major’ where the Lights of Soho bartenders energetically mixed a punchy concoction of saké, Cherry Brandy, Orange Liqueur and Blue Curaçao, topped with tonic. Ghost In The Shell will be out in cinemas from 30th March 2017.